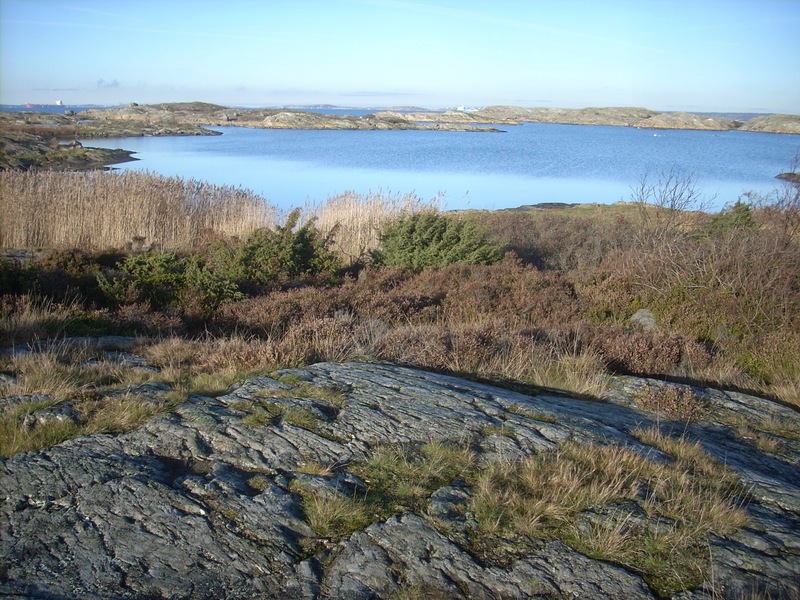 Today, we went island hopping on the southern archipelago, starting at Saltholmen. Interesting 20 minute tram ride to the port. First time seeing detached housing. Quite pretty. 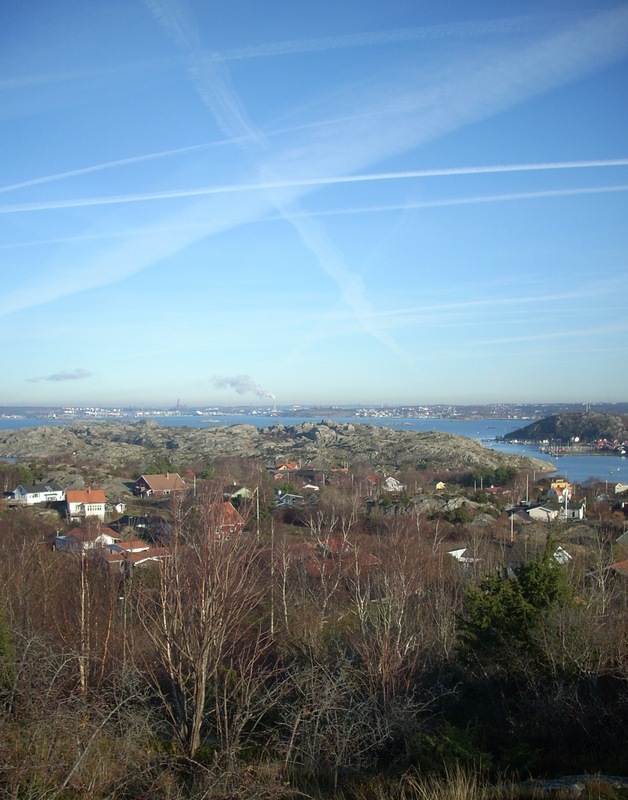 Many of the houses are situated on hills. The same ticket that gets you on the bus, also gets you on the tram (LRT), which gets you on the ferry. Very convenient, and cheap, and it’s a ride re-fillable card that you swipe on the bus, or tram, or ferry. No tickets. At the port, we took a ferry to Branno, one of the many islands in the area. Not crazy about boats, but we stood outside watching the waves, so that helped a bit. Saw some cormorants, geese, seagulls, and swans. Not the first swans I’ve seen. Seems an unlikely bird for these parts, but everything I know about swans I learned from children’s books, so I’m guessing I know very little. I prefer cormorants anyway. Branno is extremely beautiful, in a rocky, quaint sort of way. 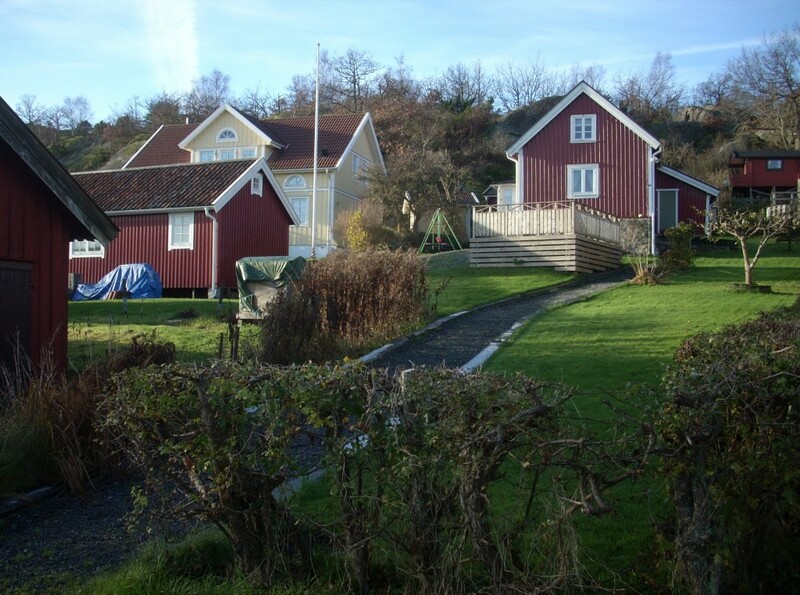 Extra wet here so the grass is deep green, making the yellow, blue and red houses shimmer in the sunlight. It was a gorgeous day. No wind. We walked to one end of the island on the way to Galtero, another small island. Didn’t make it. The last part of the trail was very marshy, and I had a soaker (my left foot) so we sat on one of the many giant, flat rocks and had lunch. I said I wouldn’t talk about food again, but at that very same bread place yesterday, we bought these circles of crispy bread. They have all kinds, and we picked one with caraway seeds. Delicious with slices of cheese. The bread has the consistency of…I don’t know…crackers, for lack of an equivalent textural experience. During lunch, we watched cargo ships in the bay. It was so quiet, we barely heard them. After lunch, we trekked back to ‘town’ and made our way through narrow streets and still flowering gardens to a lookout point. 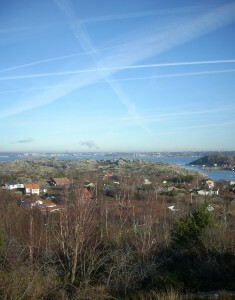 I’ve never walked up so many hills, here and in Gothenburg. Spectacular view. Back to the port, but we miscalculated the timing, and so had an extra hour to kill. Walked to the opposite end of the island and spotted three deer scrambling on the rocks. Deer? On an island? They must be retarded. Very shallow gene pool. Found a graveyard. The oldest graves were from the late 1800’s. No Vikings, but I think they set their corpses on fire and sailed them out on the water in barges, or something like that. Not sure if this is an island or a Swedish tradition, but all the graves had beautiful pine wreathes with moss tucked in the needles at regular intervals, topped with three pine cones. Very striking. Think I’ll attempt to copy the look at Christmas. For the door. 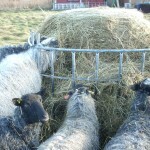 On the way back, we came across some sheep feeding at a hay thingy. I have a lot of time for sheep. I love everything about them, except maybe their freaky, horizontal pupils. Sharon and I were able to pet a sheep that casually wandered over to us. It was awesome. The petting. Really dug our fingers in, and the sheep liked it, I could tell. It was just like petting Maggie, without the hair and the licking. Gave her a good scratch behind both ears, and then Sharon pulled Timothy hay out the sheep’s wool and fed it to said sheep by hand. 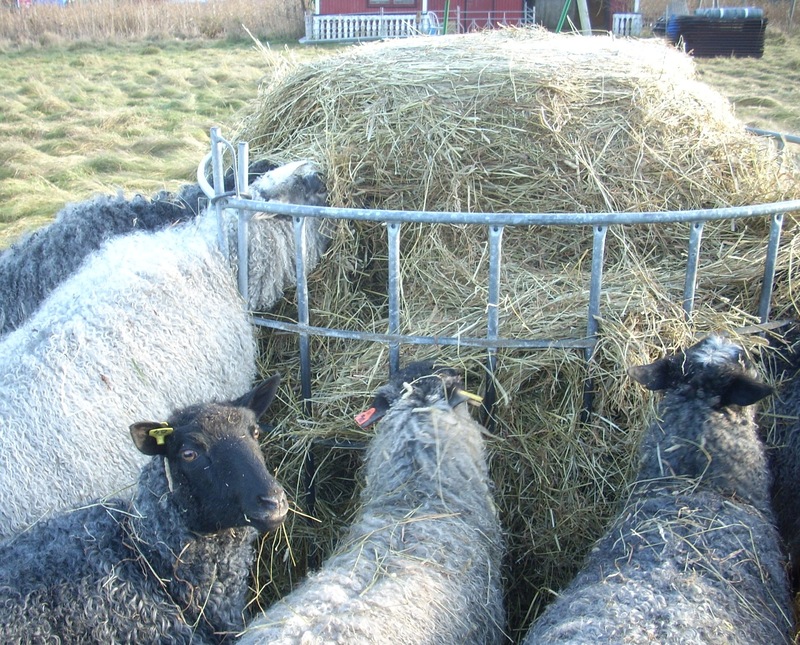 The other sheep were just not that interested in being fondled by a couple of dog-starved Canadians. The archipelago was gorgeous, but petting sheep? That was cool, man. The ride and short walk home was incredibly cold. Too cold to even stop at a bakery for a confection. I think the wet finally got to us, because it was not particularly chilly outside, and by the time we got home, I just wanted to stuff my entire body into my mug of coffee. No bath here, just a shower, so I put my jammies on over my clothes and tried to warm up. I was successful, a few hours later. I need to find myself a tall, warm Swede to wrap myself around. Tomorrow, an English bookstore, the Fish Church, and a giant, smelly whale.